The perfect home for horses starts at Walsh's Country Store. We offer a wide selection of quality horse barns in CT, including impressive and roomy modular barns, run-in sheds and more to keep your horses comfortable, safe and out of the weather. 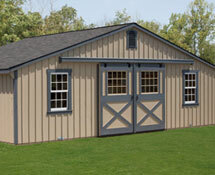 Our horse barns, run-in sheds and modular barns can be completely customized to your specifications. We offer a wide array of options from your choice of colors, trim, doors, windows, cupolas and much more. Just ask one of our experienced sales staff for more details. Visit our showroom to see our run-in sheds and horse barns in Seymour, CT. Our friendly sales staff will be glad to answer any questions you have! Whether you have one horse or a herd, we have a great selection of quality horse barns to keep your equine friends sheltered and happy. 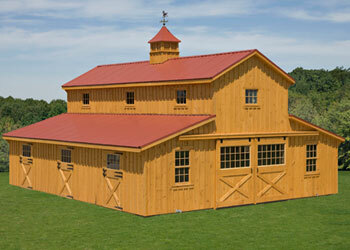 We can customize your horse barn to suit your needs. Create essential shelter and safety for your horse herd. 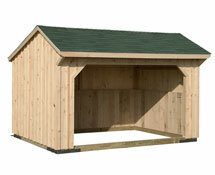 Our run-in sheds are available in a variety of sizes to suit your needs. Great for multiple horses, saddles, tack and much more. Our modular barns also make great workshops for woodworkers, car enthusiasts and artists too. Imagine a workshop or studio right in your own backyard! 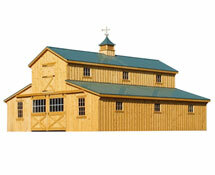 Customize our modular barns to your heart's content.